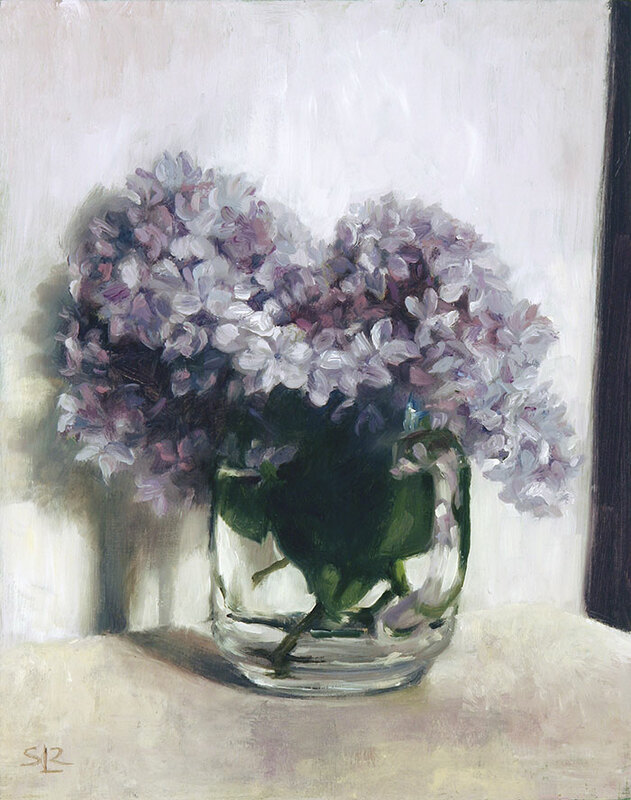 Lilacs in a glass cup, oil on panel, 8" x 10"
The spring blossoms continue their relentless march. Magnolia, crabapple, serviceberry, and redbud--all finished. Daffodils and muscari long gone, and even the latest of the late tulips starting to drop their petals. The Siberian iris blossoms unfurl only to curl themselves up the very next day. But the spectacular white tree peony at least is in full-blown bloom. It's planted along the sidewalk where its scent and the almost obscene extravagance of its flowers stop passers by in their tracks. Dogwoods, spirea in bloom, mock orange almost. The season unfolds far too quickly. I feel this way every year. Spring is the season I most wish I could draw out. But today we have a forecast temperature of 30 degrees and the first heat alert of the year; the studio is sweltering, and towering white clouds, promising late day thunderstorms, are half crowding the blue sky out of my skylight windows, so it's futile. Still, I had to make some small attempt to arrest the season with a painting of lilacs clipped from the new tree (shrub really) I planted last week. It's called Wedgwood Blue and its bracts smell like childhood adventures in untended gardens around the houses of great aunts. But even now, the cut blooms are browning in their cup and the few I left on the tree are almost done. I'm already longing for next spring.